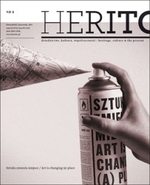 Herito – a bilingual English-Polish quarterly – is a new initiative by the International Cultural Centre. It is our hope that it will come to be a unique forum for discussions on heritage, culture, our times, and the future. As a periodical it will focus on issues of locus and related reflections, on space and its various meanings, and on the geography of the imagination and of memory. The pretext for the topics it undertakes to examine is Central Europe, which has a heritage of experience and cultural dilemmas that are at once unique and highly relevant to contemporary debate.